Ocean Isle Beach, North Carolina. May 6, 2009. I didn’t have an opportunity to get any watery pictures this past week, so I pulled the above picture from my archives. 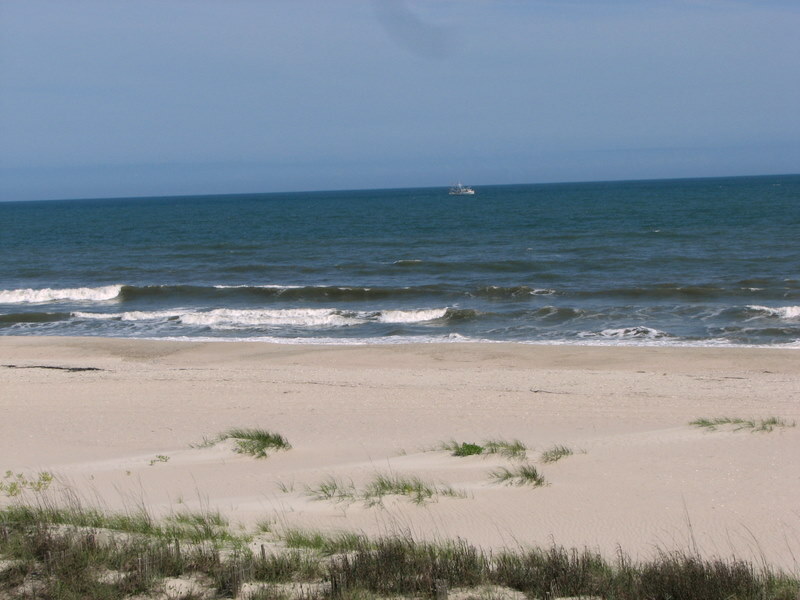 This picture was taken in May of this year at Ocean Isle Beach in North Carolina. The weather was absolutely beautiful while we were there, as you can see from the picture. If you closely (the picture can be enlarged) you’ll see a shrimp boat. I’m not sure, but I think it was busy catching our dinner for that night. That’s another nice thing about this part of our watery world: the seafood is fresh — and delicious. 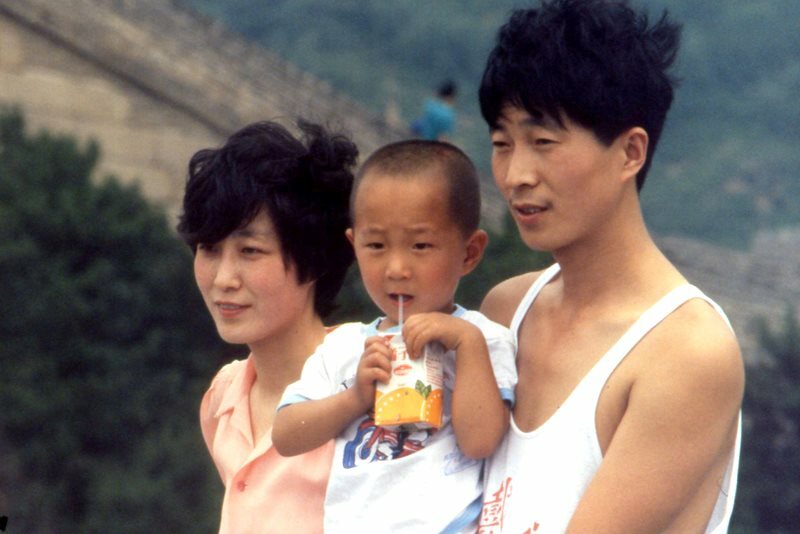 Chinese family at the Great Wall. July, 1987. I went to China for the first time in 1987, and our hosts took us to the Great Wall near Beijing. Back then there weren’t a great many foreigners visiting the wall, and there were relatively few of what I would call ordinary Chinese there. But then I saw the young family in the picture above. They were very simply dressed, but they took in the Great Wall with the same mixture of awe and amazement that we foreigners did. They were obviously proud of China, its history, and its accomplishments. On that day I was happy to be a part of their world. Betsy at St. John's, Antigua. September 12, 2001. The third port of call on out honeymoon cruise was St. John’s, Antigua. Antigua was an island we thoroughly enjoyed visiting. We especially liked the beautiful coastline of the island. Antigua was a major sugar-producing colony for Great Britain and, because of it’s strategic location, it became Britain’s most important base in the Caribbean. In 1784 Admiral Horatio Nelson sailed to Antigua and established a naval base at English Harbor. We visited Nelson’s Dockyard, the restoration of dockyard Nelson commanded. We also visited Shirley Heights, which offered panoramic views of English Harbor. Shirley Heights were fortified by the British for the protection of their base and contains the remains of gun emplacements and military buildings. One of the unusual sights along the heights was cactus — parts of the island are arid. To see more of Antigua click HERE. Charlotte Amalie, St. Thomas, Virgin Islands. September 10, 2001. 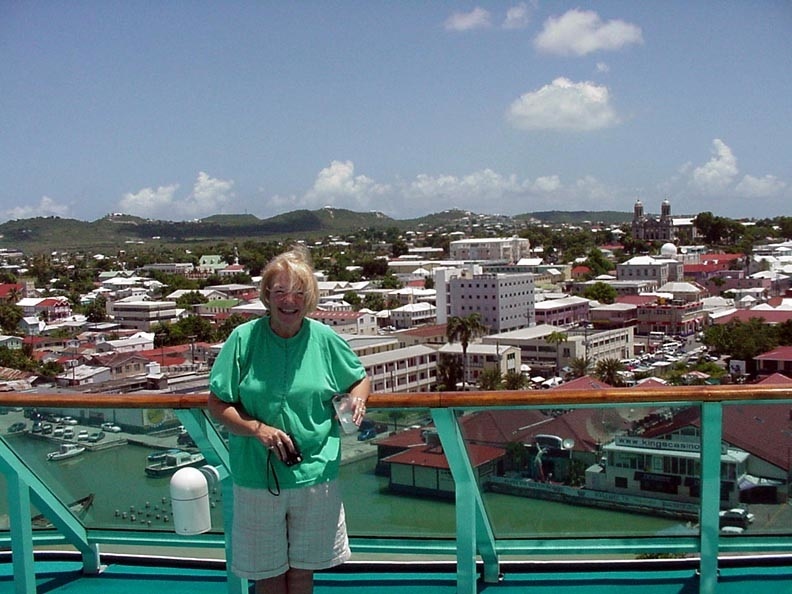 A couple of weeks ago I shared some pictures of St. Maarten from our honeymoon cruise in 2001. We were on St. Maarten on 9/11, which made for a very surreal day. 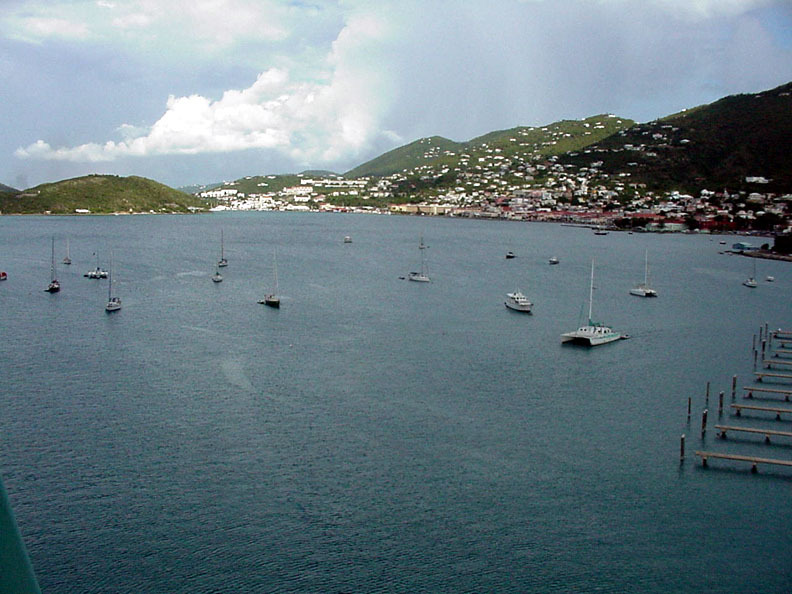 Our first port of call was Charlotte Amalie, St. Thomas, U. S. Virgin Islands. While there we took a sea plane ride in the morning over some of the other nearby islands. In the afternoon we took a tram to Paradise Point, a park and overlook that offered some fantastic views of the harbor and ocean. To see more of our day on St. Thomas click HERE. I thought I was going to be able to get a fair amount of work done in the yard yesterday, but after a sunny morning the rains returned. We didn’t get a lot of rain, just enough to keep things wet and me inside. One of the things that didn’t get done was planting some lily bulbs that came the other day. The new flower bed we constructed in front of the house gets plenty of sunlight and we thought lilies would do well there. Lilies are probably our second favorite flower after our roses. We already have a quite a few lilies in our garden. 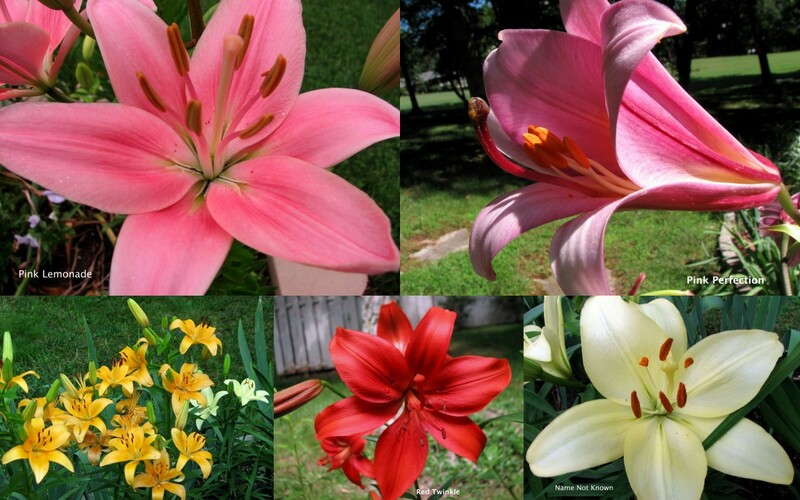 The collage above shows some of our lilies. Other collages can be seen HERE, HERE and HERE. We were in St. Augustine, Florida, the day before Betsy’s birthday this year. 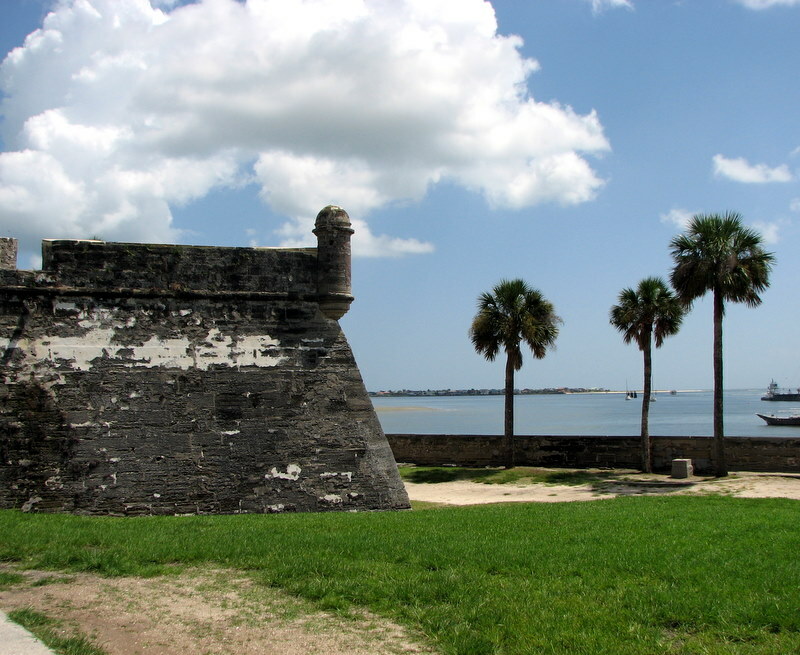 We stopped to visit Castillo San Marcos. The day was beautiful with white clouds floating through a blue sky. It seemed possible to step back in time on such a day. The bride and groom, Knoxville, Tennessee. June 23, 2001. I married the beautiful woman above 99 months ago. We had a whirl-wind romance — we met in January, had our first date in March and were married in June. But it was obvious that God was at work in our lives. We realized there were some disadvantages to getting married at our age — pushing 60. One disadvantage was that we most likely wouldn’t have as many anniversaries to celebrate as we would have if we were younger. So we decided we would celebrate monthiversaries as well. Our monthly celebrations aren’t particularly fancy — last night we had dinner at Cracker Barrel — but it is a a time when we can appreciate the blessings we have in one another. We still make a bigger deal out of anniversaries, but our monthiversaries are special times for us. Yesterday we celebrated 99 months. We hope there are many, many more to come. Akron Falls, Akron, New York. October 24, 2008. Since it is now officially autumn I thought I would share the picture above since it has a nice autumn look about it. This picture was taken last October when we were visiting my daughter Kelly and her husband in western New York. 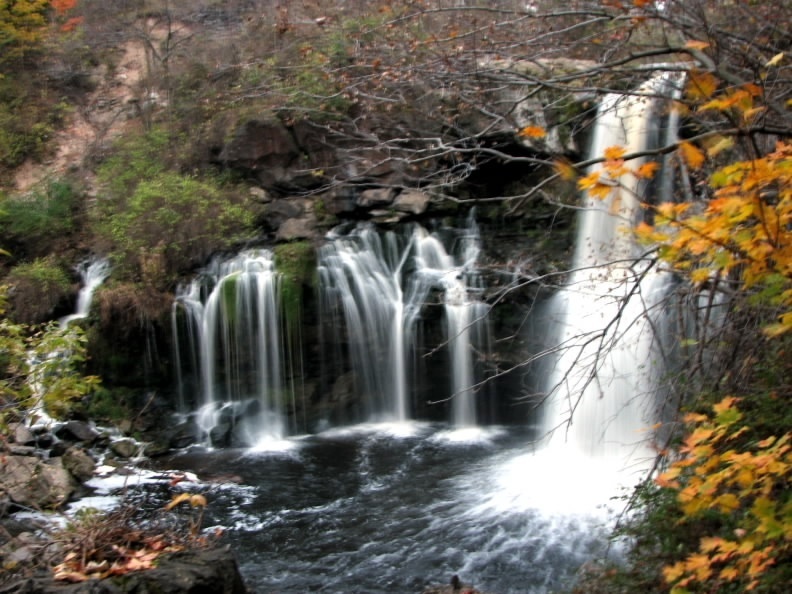 Akron Falls is the centerpiece of Akron Falls Park in Akron, New York. 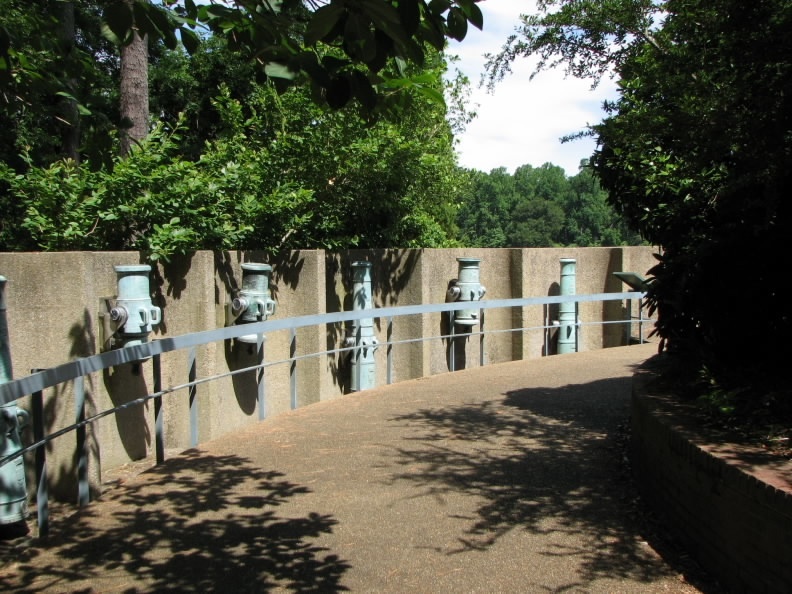 There is a short hiking trail leading to an observation deck. We visited the park in the early evening and definitely enjoyed our visit to this beautiful part of our watery world. If you would like to see more of Akron Falls click HERE. Cannon surrendered by the British at Yorktown, October 19, 1781. 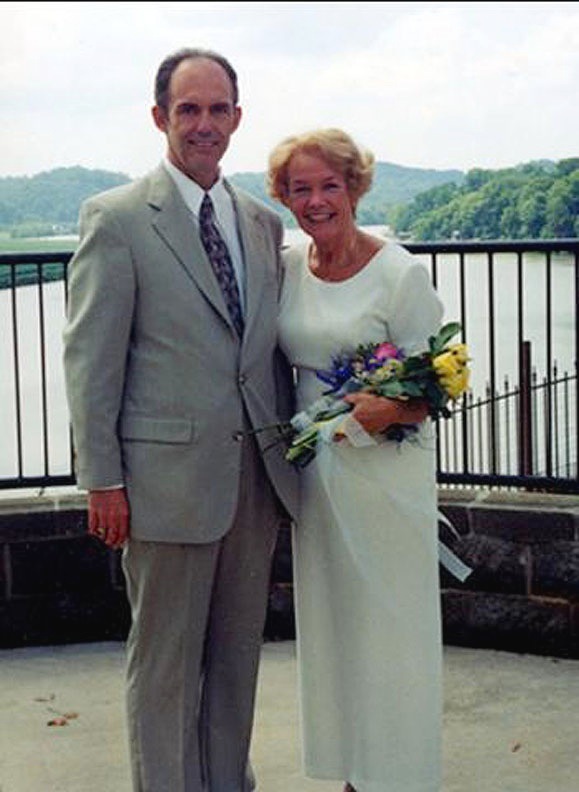 In June, 2007, Betsy and I made an anniversary trip to Virginia. We went to spend several days at Colonial National Historical Park and at Williamsburg. The siege of Yorktown in 1781 was the last major battle of the American Revolution. It came about after a French fleet defeated a British fleet at the mouth of Chesapeake Bay, making it impossible for British Lord Cornwallis to get help or to escape by sea. The American and French army marched to Yorktown on September 28, 1781, and after a week of preparation, constructed their first siege line on October 6. They began bombarding British positions on October 9. To see more of the Yorktown Battlefield click HERE. 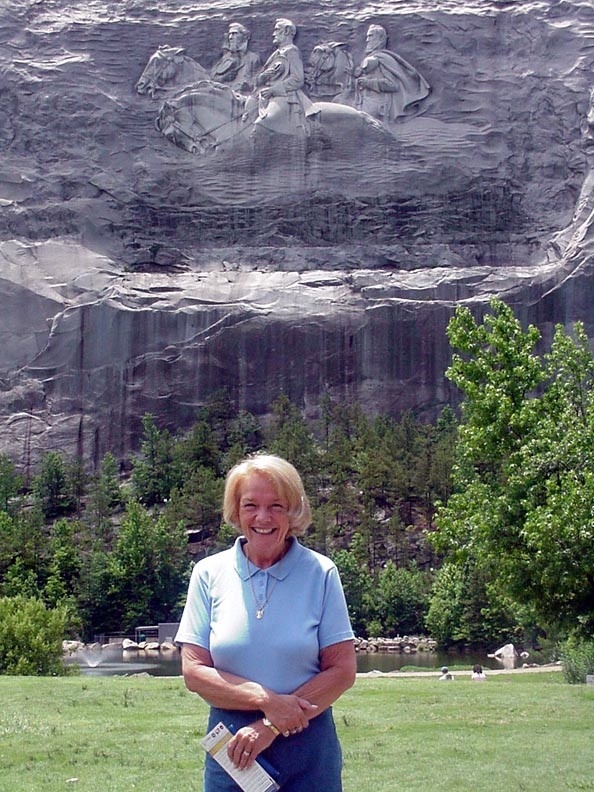 Betsy at Stone Mountain, Georgia. June 2, 2009. One of the advantages of having so much rain over the last few days is that I’ve had the opportunity to work on some of my older pictures that had been copied to disk to be worked on ‘later’. Well, ‘later’ came this past week, and I have enjoyed working with pictures that I had practically forgotten about. One of the folders I found was of pictures taken in Atlanta, Georgia, in June, 2001, about three weeks before Betsy and I were married. We had been invited to the wedding of the oldest son of one of Betsy’s childhood friends. Since Betsy and Susan, the mother, were good friends, we were invited to come down early for the rehearsal dinner on Friday evening. I got to meet another of Betsy’s childhood friends, Nita, and learn some things about my future bride that I didn’t know (all good, of course). Saturday morning Betsy and I went to Stone Mountain Park outside of Atlanta to enjoy the day and see some of the scenic attractions of that beautiful area. After an enjoyable few hours at the park we went back to the city for the wedding and reception. If you would like to see more of our weekend in Atlanta click HERE.